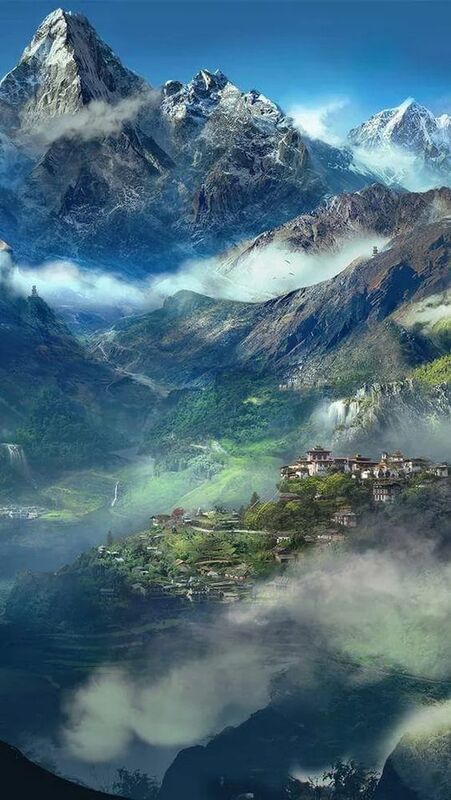 Mists Shrouds Tibetan Mountains. Origin of Tibetan Singing Bowls. Take a deep breathe, and feel the crisp autumnal air fill your lungs. Your eyes are dazzled by bright crimson, magenta and cyan flags dancing under the sunlight and you hear a clean, but soft sound, reverberating through the air. You are in Tibet, with the summits of the mighty Himalayas shrouded in the distance. You draw your attention back to the warm hum, curious to find the source of that celestial music. You have discovered the melodious Tibetan Singing Bowls. Tibetan Singing Bowls, like their bell-chiming cousins found in clocks, often mark the passing of time or change of activity in meditative ceremonies. With earliest records dating back to the 15th Century, their sound has echoed throughout history and played a significant healing role in the lives of millions. Today these historic Singing Bowls have retained their importance and have adapted with remarkable ease to remedy modern maladies. Their application is varied but mainly straddle two key fields: stress release in the form of mediation and energy work. The melody and vibration of the Singing Bowls tap into our auditory senses, quieting the mind. For those who find themselves wondering about if they had locked the door earlier during attempts to meditate, then this is great news. This is because, as the vibrations of the Singing Bowls mimics the effect created when people chant, the reverberations induce deep meditative and peaceful states. Ultimately, the Singing Bowls heighten the quality of meditation to even greater depths. For those seeking reinvigorating energy work then the Singing Bowl Massage is for you. This therapy aligns with the ancient theory that the human body has seven chakra energy centres which relate to various body parts. Each distinct chakra is associated with colour, energy purpose and sound. The enchanting ring of the Singing Bowls activates the body’s own ability to resolve problems and heal negative emotions. The vibrations which resonate from the Singing Bowls act like acupuncture needles, and stimulate and allow vital energy to flow freely. The result is similar to the benefits felt during the Singing Bowl Meditation but on a deeper level: it allows people to disconnect from their worries and concerns allowing them to relax in the present moment. Results form any Singing Bowl or Sound Therapy can vary from a deep sense of relaxation, to relief from physical and/or emotional pain. Anne our expert explains the sensation “as feeling of lightness as the body lets go of past emotional and physical issues. As Anne, our expert, explains “results from any Singing Bowl or Sound Therapy can vary from a deep sense of relaxation, to relief from physical and/or emotional pain”. A common description of the sensation after the session is one of lightness, as though the body has let go of worries and stress. Regardless of your individual motivation, the Singing Bowls evoke a sensuous level of inner-relaxation whilst simultaneously transporting you spiritually to the acme of the Himalayas. Suitable for beginners and prolific meditators alike, this new therapy guarantees a welcome pause amid our hectic Hong Kong life.